DeJur was primarily an importer / distributor of items branded under their own name. They were most well known in the 40s and 50s for amateur movie equipment, but they dabbled in other things like enlargers, meters, and the occasional still camera. In the 60s the company went into office photocopiers, and sold out in 1974 when the owners, Harry and Ralph DeJur, retired. Personally, I think this this a Zeiss Ikophot: the case design looks the same to me. Plus—this is an old meter. It was sold in the early 40s as the Model 5-A, and the only difference is that this 5-B has a calculator dial calibrated in ASA; the 5-A uses Weston numbers. When the war interrupted, German trademark and patent protections evaporated. 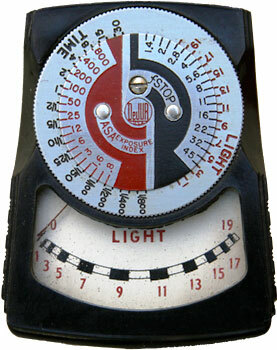 So while this meter says it was made in the USA, I believe it had originally been licensed from Zeiss. A simple meter, just aim it, read the number the meter points to, and dial it into the calculator, which puts in a class with the Skan, Gossen Sixtus and GE's Mascot. Not a great meter, but a good backup or a good "first meter." It does fit nicely and there are little notches in the sides so you can turn the calculator dial, making it a one-handed operation. If you're holding a camera with your other hand, that's always a nice feature.